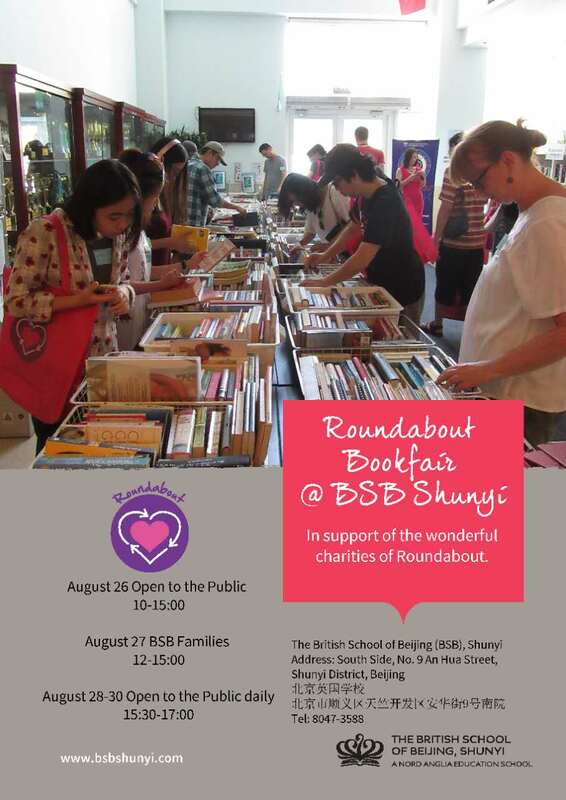 Come & support the biggest Roundabout Book Fair at the British School of Beijing. Come by & buy from thousands of donated books and help make a difference to the lives of children supported by Roundabout. Thousands of recently donated books for sale. We need volunteer support to make these book fairs happen. Please email fhm-wob@t-online.de If you would like to volunteer. our next and biggest fair at BSB on August 26. We need volunteers (two or three per day) for tidying up the books during the sales days August 28-August 30 free timing. All our Book Fairs are not possible without the support of so many volunteers. Please let me know when you can come and help us help those in need. WE ALSO URGENTLY NEED REGULAR BOOK ROOM VOLUNTEERS FOR SORTING, PRICING, ETC. FRENCH, DUTCH ….). WE NEED HELP TO SORT AND SELL THEM. VERY GOOD DEALS AVAILABLE. ALSO AVAILABLE TEXTBOOKS (MATHS ETC. ).